When news broke Thursday that the Jays had signed Edwin Encarnacion to a three-year, $29 million extension, you could be forgiven for thinking these three little words: That’s so Alex. Since taking the reins in Toronto in October 2009, Alex Anthopoulos has developed a reputation as one of the most tight-lipped general managers in the game. With the market for hitters painfully thin ahead of the July 31 trade deadline, Encarnacion is projected to be the best available bat — that is, if the Jays decided to sell. With a .500 record playing in the toughest division in baseball, but also chasing a second wild-card spot that figures to be wide open, teams were waiting to see if the Jays might become buyers, or sellers. Locking up Encarnacion with a three-year contract was on nobody’s radar. If the secrecy of the deal struck you as typically Anthopoulos, so too should the dollar amount. As sports fans, we often think of players in black-and-white terms. Hell, analysts sometimes fall into this trap too. Derek Jeter is “good.” Clint Barmes is “bad.” So if you think Encarnacion is a star player by dint of his 23 homers and .295/.382/.565 line at the All-Star break, $29 million looks like chump change. If, on the other hand, you see Encarnacion as the moderate power, low-on-base, lousy-defense player of 2009–2011, handing out a three-year guaranteed contract for any kind of significant money looks ugly. To help guide our thinking on this deal, we can consult our old pal Wins Above Replacement. If you’re new to WAR, here’s how it works: Take a good player on a Triple-A roster, or the 25th man on a big league team. He’s your replacement-level player, someone you can usually acquire for next to nothing on the open market or via trade. Every other player is defined by his ability to produce X number of wins for his team, above or below that replacement-level standard. A two-win player is average. A four-win player is considered very good, a borderline All-Star. Above six wins and you’re an MVP candidate. If you crack 10 wins, you’re having a season for the ages. Now let’s sync dollars with wins. The prices paid for free agents last winter suggested a market-value price of about $5 million per win. Salaries tend to rise every year, and players tend to produce less value as they pass their peak, which usually falls in their mid-to-late-20s. But by and large, the math on the Encarnacion deal is simple: At $29 million over three years (the deal actually pays Encarnacion $8 million in 2013, $9 million in 2014, and $10 million in 2015, with a $10 million club option or $2 million buyout in 2016), Encarnacion is being paid as roughly a two-win player, on average; call it 2.5 wins in his age-30 season next year, then two wins in 2014 and 1.5 wins in 2015. In other words, the Jays are paying Encarnacion to produce about league-average value over the next three years. Easy, right? Encarnacion is on pace to top 40 homers this year. If he comes anywhere close to that level of performance over the next three years, the Jays will have themselves a bargain. If only it were that simple. Let’s start with the different ways different teams spend money. It’s all well and good to add up all recently signed free agents, grab an average cost, and conclude that that’s the way to pinpoint any other player’s market price. But baseball players are compensated at wildly different rates depending on where they are in their careers. Players almost always cost less than market value before becoming eligible for free agency, sometimes millions or even tens of millions less. And they often cost more than they’re worth once they sign their first free-agent contract, sometimes tens of millions or even a hundred-million-plus more. So far, the Jays have made a point of not spending big bucks for free agents. That means they’re operating by entirely different rules than teams like the Yankees. Then there’s Encarnacion’s skill set. Even playing DH more than he ever has over the past couple years, Encarnacion has been a net negative on defense. Mercifully, he no longer gets to justify his “E5” nickname on a daily basis while botching grounders at third. But even at the less demanding position of first base, he’s a subpar defender. Whether the Jays live with him in the field or make him a full-time DH, they’ll get nothing in the way of positive defensive value from Encarnacion. Oddly, he’s stolen nine bases this season, which already counts as a career high. But Encarnacion’s not going to win you games by going from first to third more often than the next guy, and he doesn’t figure to suddenly get faster and become a plus base runner as he enters his 30s. Which brings us to Encarnacion’s meal ticket: his bat. Two months ago, we looked at the thresholds at which certain stats tend to stabilize. One of the players profiled in the piece was actually Encarnacion. In it, we noted how fly ball rate tends to stabilize (and become a relatively reliable indicator of performance) around 250 at-bats. Encarnacion has now tallied 356 at-bats, and ranks second in baseball, with a career-high 50.6 percent fly ball percentage. If you’re Juan Pierre, fly balls are bad. If you’re a power hitter like Encarnacion, fly balls can be good — and an uptick in their frequency can portend or even cause a spike in home runs. There are other good signs in Encarnacion’s underlying numbers this year: His walk rate has climbed to 10.4 percent, just shy of his career high (though some of that’s certainly a result of pitchers being more careful with him rather than a great improvement in his batting eye). Encarnacion’s 15.7 percent strikeout rate also sits below his career rate of 17.1 percent. And his .293 batting average on balls in play doesn’t look out of place with league averages (just above .290) or his own career BABIP (.284). Two numbers do stand out as outliers and possible signs of regression ahead, though. Encarnacion’s hitting homers on a career-high 17.8 percent of his fly balls. Much weirder are Encarnacion’s infield hit stats: For some reason, Encarnacion’s reaped infield hits on 18.6 percent of the ground balls he’s hit this year, obliterating his previous career high of 10.2 percent. Care to guess where that places Encarnacion among his hitter peers? Try number one. Not one everyday player in all of baseball has legged out infield hits at a more prolific rate than Edwin Freaking Encarnacion. Part of that’s surely due to small sample size: The smaller the sample of anything, the more likely you are to see odd results, and Encarnacion has hit ground balls at a lower rate than all but seven other players in the game, with a low 33.7 percent rate. Still, you have to chalk at least some of this up to incredible, and likely unsustainable, good luck. The infield hits might be quibbling a bit: If Encarnacion reverts back to being a .260 hitter, but still whacks 40 homers a year, he’ll earn out his contract, and then some. What’s at issue here is the power. Is it likely to persist? When trying to figure out if a player’s improved performance is for real, it can be instructive to look at changes in approach. In this case, those changes are very real. 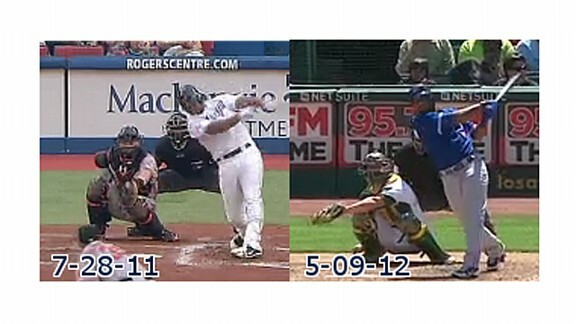 For the first time, Encarnacion is finishing his swing with two hands instead of one. 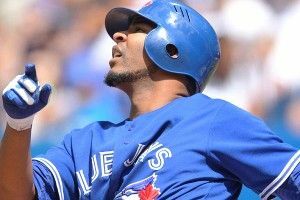 Encarnacion said that tweak allows him to take shorter, quicker hacks at the ball, which could in turn boost his power. Given Encarnacion’s career-high HR/FB rate, it might be a combination of that new approach and a little bit of plain old luck that’s driving the homer surge. If all of this sounds familiar — the swing change, the sudden huge breakout, the lucrative contract extension — it should. Encarnacion’s teammate Jose Bautista has grown into the most prolific power hitter on earth, with a staggering 124 homers since the start of the 2010 season (Albert Pujols is a very distant second with 92). Bautista came out of nowhere to clobber 54 bombs in 2010, prompting the Jays to give him a five-year, $65 million contract. With Bautista, as with Encarnacion, supporters loved getting a 54-homer guy for about the price of a three-win player, while critics shot back with various arguments that often included the words “Brady” and “Anderson.” A year and a half into that deal, Bautista looks like a huge bargain. Given the somewhat similar profiles — talented slugger finally puts it all together in his late 20s — couldn’t we assume the same success for Encarnacion? Shouldn’t we? I’d be inclined to say no. One kind of similar player doesn’t constitute a robust precedent. But here’s the thing: It doesn’t have to. Because above all else, what Alex Anthopoulos is doing here is hedging. Three years and $29 million prices in some sizable decline for Encarnacion from his current 40-plus-homer, out-of-nowhere .295-hitting pace, just as five years, $65 million did from Bautista’s sudden offensive explosion in 2010. There’s a second hedge in play too. Because of Toronto’s .500 record, and the crowded competition they figured to face for a playoff spot, the Jays would need to catch some breaks to make the postseason. But sitting just 2½ games out of the second wild-card spot, a white flag trade wasn’t going to win Anthopoulos and the Jays many friends among the media or fans. Signing Encarnacion allows the Jays to maintain something of a go-for-it stance this year even with all that competition, plus a Swiss cheese starting rotation; it’s not like the Red Sox, Rays, Indians, Tigers, and other would-be challengers look like world beaters right now either. Plus that 3/27 deal will likely look attractive to other teams, too, such that Toronto could always decide to flip Encarnacion later on. Hell, if they suddenly fall into a 10-game losing streak, they could trade Encarnacion before the deadline anyway, with acquiring teams knowing they’re getting more than a two-month rental, as well as the guy who might be the best available hitter on the market. Statheads have a tendency to venerate GMs who squeeze maximum value out of their moves. Daryl Morey, the Rockets GM who deploys sophisticated statistical analysis more aggressively than perhaps any other general manager in his sport, garners huge respect in basketball circles … even though his Rockets have only once made it past the first round of the NBA playoffs during his tenure. Andrew Friedman’s Rays get all kinds of love in the pointy-headed world thanks to their ability to hang with and sometimes beat rivals who spend three, four, or even five times as much on payroll … but the Rays have never won a World Series, even if their string of three playoff appearances in four years is impressive. As for Billy Beane’s A’s … you may have heard a thing or two about their exploits … but they, too have only made it past the first round once with Beane in charge. Anthopoulos gets a lot of those same accolades. He’s re-signed many of his own players (Ricky Romero, Adam Lind, Yunel Escobar, Bautista, and now Encarnacion) to long-term deals rather than break the bank on free agents, a strategy that tends to pay off more often than not. He makes savvy little moves to gain small edges, such as loading up on veteran relief pitchers on one-year deals to reap compensation draft picks. He even traded cash for Miguel Olivo in November 2010, then granted him free agency on the same day, thus essentially buying a compensation pick at a below-market price. And in his biggest coup, Anthopolous found a way to unload $86 million worth of Vernon Wells on the Angels, a move that scientists will surely discuss 90,000 years from now as the platonic ideal of a dump job (just imagine how they’d react had the Jays not then turned around and flipped Mike Napoli to Texas for Frank Francisco). Of course the Jays have even less to show for all their moves than do Morey, Friedman, and Beane for theirs: Toronto sits a respectable but unspectacular eight games over .500 in the two and a half years that Anthopoulous has run the team. Signing Edwin Encarnacion at a potential bargain price rather than ditching him in a give-up trade or losing him outright at year’s end could very well become another feather in the cap of one of baseball’s shrewdest operators. But the lingering question remains: Will making the right moves at the margins and mixing in occasional home runs be enough to push the Jays deep into October, especially while toiling in the AL East? Or will they need to tap into parent company Rogers’s deep pockets and go get a star or two on the open market to win the big one? Stay tuned.